Let’s go hunting for some upsets! Well, we won’t mind at all if all goes according to plan here on Day Two, but that wouldn’t mean A Lot of Sports Talk‘s live blogging experience at the U.S. Open, wouldn’t be as much fun! Even if the upsets don’t happen, drama is sure to ensue with many of the matches here, including tonight’s match on Ashe Stadium between two-time Grand Slam champion and 2012 US Open conquerer Andy Murray and the latest man to now carry the title of “tennis bad boy,” Australian talent Nick Kyrgios. We definitely want to see how the reaction from the New York City crowd will be when Kyrgios walks onto the court. I’m not expecting to use “warm” as one of the words to describe that. Until then, it’s time to get a bottle of Evian and walk around the grounds, and there’s some amazing action in the first matches of the afternoon session, and some of the players features include this year’s French Open women’s semifinalist, Timea Bacsinszky, the French Open women’s finalist, Lucie Safarova, and the man who took down Rafa Nadal at Wimbledon this year, German-Jamaican Dustin Brown. Here’s a bold ALOST declaration: if Brown makes it to the second week of the U.S. Open, I’ll grow my hair as long as his!! Time to do some blogging! Again, let us know what you’d like us to see! 9:08 PM EST: And Rogers wraps it up, 6-2, 6-2. Vickery doesn’t shake hands with the chair umpire. Have to wonder about some drama that might have happened earlier. 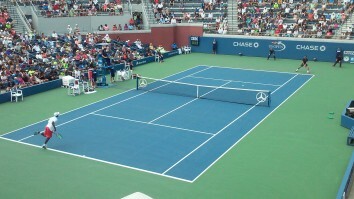 9:00 PM EST: We’re at Court 6 now, seeing a couple of young Americans go at it, Shelby Rogers and Sachia Vickery. Since we last left you, we’ve been moved from our spot in the media room to set up an open bar (I’m ok with it), watched Nick Kyrgios’ racket go flying and also interview Nicole Gibbs after her first-round win. And it looks like Rogers has this in the bag: 6-2, 5-2. 6:18 PM EST: …the media room, to get my power pack for my cell phone. But then, it’s off to Court 11, where American up-and-comer Frances Tiafoe plays veteran Viktor Troicki. At last check, the Croat won the first set 7-5, with the second set all level at three. 5:48 PM EST: Here’s that aforementioned view. Oh, and Sock just broke to take a 4-2 lead in the first set. 5:36 PM EST: Oh, and there’s another reason why we’re staying on Grandstand right now: our Internet has become lightning quick now! And with the sun disappearing behind the stands, it’s just such a scene view that we’re enjoying. 5:31 PM EST: We’re staying on Grandstand to see the start of the match between Victor Estrella Burgos and Jack Sock, the Lincoln, Neb. native who’s the No. 28 seed here. Estrella Burgos, at 35, is the second-oldest player on the ATP Tour who currently ranks in the Top 100. The oldest? Well, you just heard from him earlier in the blog: 36-year-old Ivo Karlovic. Oh, the synergy we create on this site! 5:17 PM EST: We made it just in time to see Andrea Petkovic avoid a third-set tiebreak and break Caroline Garcia to win that intriguing first-round match, 3-6, 6-4, 7-5. Garcia might have been the highest-ranked unseeded player, so for Petko to pull this win off, it must be a major boost to her prospects here in New York. Oh, and after her on-court interview, she danced! 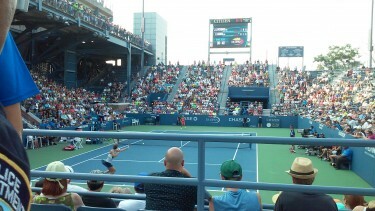 We got to Grandstand in time to see Petko’s (near) first match point, which was saved by a Garcia winner. Petko would eventually win that decisive game. 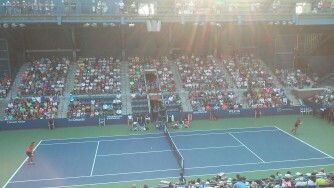 4:42 PM EST: Off to the Grandstand for the first time, and that’s actually my favorite court. So intimate! It’s No. 18 seed Andrea Petkovic and Frenchwoman Carolina Garcia in a juicy first-round matchup! After splitting the first two sets, it’s Garcia with a 3-2 lead in the third. Hope to make it there in time! 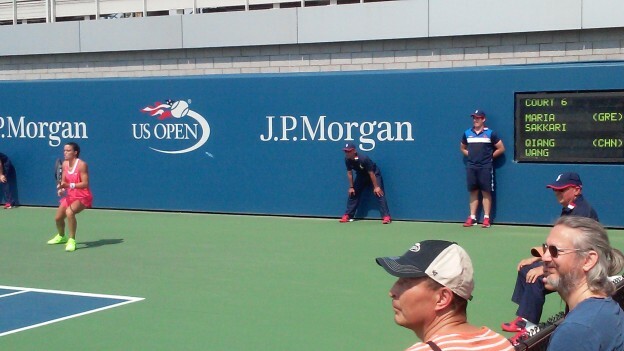 4:32 PM EST: So we had plans to make it out to Court 11 and watch 2001 U.S. Open champion Lleyton Hewitt start his final U.S. Open tournament, but his Ukrainian opponent just retired. At least Hewitt, who will call it a career after the 2016 Australian Open, will hang around NYC for a little while longer. Time for the Aussie fans to walk around again to find another Aussie player to root for. Oh, and a shame what happened to Thanasi Kokkinakis, who had to retire in the fifth set against Richard Gasquet. 3:55 PM EST: Before we actually head out, we’re about to upload an interview we just did with No. 21 seed Ivo Karlovic, who defeated Federico Delbonis in the first round. You may have known about Karlovic’s stuttering problem a few years back, but he’s come a long way from that point and he’s a great interview. Oh, and he’s confident in his basketball skills still! You’ll hear about it very shortly. 3:04 PM EST: OK, Court 17, it’s been real! We might be back to check in on Garbiñe Muguruza, but it’s time to eat, as well get the laptop out of the sun for a couple of minutes. 2:57 PM EST: The tennis gods shining down on Young as he completes the comeback, after 3 hours and 34 minutes on the court. 2:50 PM EST: The comeback is complete! And thank you courtside reporter Pam Shriver for telling us that this is the first time that Young came back from a two-set-to-none deficit. (He also was down 0-3 in the third also.) Young wins 2-6, 4-6, 6-4, 6-4, 6-4. Good job, Donald. Now it’s time to keep up the momentum to the next round, something that’s been his bugaboo (among other bugaboos). 2:46 PM EST: I’m a genius!! Well, no. Einstein is a genius. But I did call for two more breaks of serve, and it happens on successive games!! Young up 5-4, as fans gave him a semi standing ovation as he walked over to his chair after breaking. 2:41 PM EST: There’s one of the breaks I predicted. 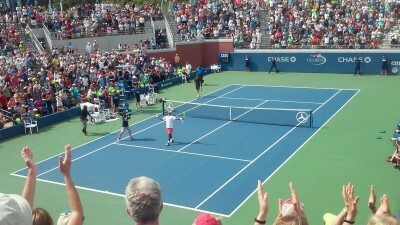 Young broken at 15 as Simon wins game on a forehand second-serve return winner. It’s 4-games all, Simon serving. Honestly, I need to take my bathroom break now! 2:30 PM EST: I guess I have to keep putting down Young’s game, as Young responds with a break right back. Young up a break, and I now have absolutely no idea what is going to happen next! My gut is there’s going to be at least two more breaks of serve before it’s all said and done. 2:30 PM EST: Uh oh. The inconsistent Young has come back again, as he’s broken at 15. Simon, who hit a sweet backhand pass as Young approached the net at 15-15, did his part to break. It’s 2-all, but Simon now is under pressure, as it’s 15-30. Now 15-40. 2:20 PM EST: U-S-A! U-S-A! Young’s forehand is back with us, and a forehand volley winner and baseline forehand winner helps to give Young the break to begin the fifth. Young holds and he’s 2-0 over Simon in the final set. Oh, and Dustin Brown just completed the reverse Donald Young, losing the final three sets to Robin Haase after winning the first two sets. Sad to see a fan favorite go, but full marks to Haase to dig in and complete the comeback. 2:09 PM EST: Young had a nice win in Montréal against Tomas Berdych this summer, but if he were to come back from two sets down against a player in Simon who won’t give you a match easily, it would be one of his best career wins. Now there are chants of “Don-ald, Don-ald!” from the crowd as he emerges from the Court 17 tunnel. 2:07 PM EST: Young wins the fourth set, and in amazing fashion: saves double break point, converts on his first set point and we’re on to the fifth! Both players take bathroom break, and we might have to do that as well! 2:00 PM EST: Here’s some Young and Simon action for you! Young serves with his smooth lefty stroke! 1:57 PM EST: As soon as I extol Young and his forehand, he mishits two forehands and gets broken at 5-2. Simon holds and now Young with a huge service game at 5-4. If he doesn’t hold and wins set, Simon will win the set, 7-5, and the match to go along with it. You can take it to the bank!! 1:47 PM EST: It’s now a double break for Young! He’s on fire, especially from the forehand wing. The American consolidates the second break and is up 5-1. Looks like fifth-set drama! We might be here for a while. 1:42 PM EST: While Robin Haase forced a fifth set with Dustin Brown by winning 7-5 in the fourth, American Donald Young is on the comeback train on Court 17! We’re here now, and, after Young dropped the first two sets to No. 11 seed Gilles Simon of France, Young won the third set, 6-4, and now is up a break, 3-1, in the fourth! Crowd has been agog the past 30 minutes! 1:24 PM EST: Here’s Gorvortsova, serving out the match! 1:13 PM EST: Final set tiebreak alert!! On the adjacent Court 15, the No. 28 seed, Irina Camelia-Begu is in a battle with Belarusian Olga Gorvortsova. Beau sleepwalked through the first set, 1-6, before storming back and bagging Gorvortsova in the second. It’s now 3-1 Gorvortsova in the third-set tiebreak. 1:10 PM EST: “Let’s Go Dustin” chants ring about Court 16 as Dustin Brown, everyone’s favorite German-Jamaican, is one game away from moving on to the second round, as he’s up 5-4 in the fourth set and by two sets to one against the Dutchman, Robin Haase. See what a win at Wimbledon against Rafa will do? You’re now a fan favorite! 12:18 PM EST: Speaking of “wow,” remember when I mentioned that Lucie Safarova was part of the afternoon session? Well, she’s no longer part of the 2015 U.S. Open women’s singles draw, as Lesia Tsurenko, who made the semifinals of the New Haven warm-up tournament after making the field as a lucky loser when Simona Halep withdrew, just wiped the Czech off of Louis Armstrong Stadium, 6-4, 6-1! 11:35 AM EST: Settled into the media dining room, and immediately made my way to one of the few tables that’s adjacent to an electrical outlet! To slightly alter the famous Lord Acton quote: Power is awesome, and absolute power is even more awesome! Also, the Internet is lightning quick. I expect that to grind to a halt as more spectators with their phones pile into Ashe. But for now, we’re set!